Video clip synopsis – Students and the Honorable Mal Brough look at how best peak bodies work for the community they represent. Broadband MP4 indipeak_bb.mp4 (6.3MB), suitable for iPods and computer downloads. Talkback Classroom is a forum program run by the Education section of the National Museum of Australia. Each year a series of forums is held. At each forum a panel of three secondary students, selected from schools Australia wide, interview a leading decision-maker on an important current issue. The panel members participate in a ‘learning journey’ to explore the issues and prepare for the forum. This involves researching the issue being explored by the forum and interviewing relevant people in the community. Panellists also develop interview techniques in workshops at Parliament House and the National Museum of Australia. The interviews are then recorded in the Museum’s Studio in front of a live student audience. This clip comes from a 2007 forum on ‘Indigenous representation’. 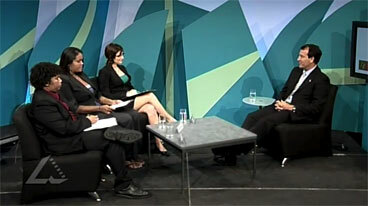 The guest interviewed was former Minister for Families, Community Services and Indigenous Affairs, The Hon. Mal Brough MP. Panellists were NT Year 12 students Brendon Kassman, Danielle Lede and Esmeralda Stephenson from Casuarina Senior College, Darwin. The learning journey involved students exploring the collection of Aboriginal art and material culture at the Museum and Art Gallery of the Northern Territory in Darwin and interviewing senior curator Franchesca Cubillo. They also interviewed Douglas Bon, skin group brother of Eddie Mabo and Marion Scrymgour, Member for Arafura in the Northern Territory Parliament. The learning journey also included a visit to Gunbalunya (Oenpelli) Indigenous community in West Arnhem Land and an interview with the area’s local elders. The European colonisation of Australia has had a great impact on Aboriginal and Torres Strait Islander Australians. Many meetings between European and Aboriginal cultures were unsuccessful: Aboriginal disenfranchisement and the effects of white society resulted in inequalities and tensions. By as early as 1869 the colonies began to remove Aboriginal children from their families in an effort to assimilate them and ‘protect’ them. During Federation and the drafting of the nation’s constitution, reference to Aboriginal people was made only twice: Aboriginal people were to be managed by state authorities, not the Commonwealth, and they were not to be counted in the national census. National discussion between 1910 and the 1960s debated the wisdom of indigenous welfare being managed in this way. This debate intensified during the 1960s. Key events of the 1960s that informed the growing national awareness of the state of indigenous people in Australia included the Yolngu people’s 1963 presentation of the Yirrkala bark petition to the Commonwealth government, the 1965 freedom ride and the 1966 Wave Hill walk-off. In 1967 a national referendum was held and 90.77% of Australian people voted “yes” to give Aboriginal people the right to be counted in the census and granted the Commonwealth the capacity to legislate for Aboriginal and Torres Strait Islander people. Initially, change occurred slowly following the ‘67 Referendum, and partly as a result the Aboriginal tent embassy was erected on the lawns of the Parliament House in 1972. By 1976 the Northern Territory Land Rights Act had been passed; later in 1994 the landmark Commonwealth Native Title Act was also passed and in 1990 ATSIC was established as the peak body for indigenous Australians. In more recent times the former Howard government introduced the Amendment to Native Title Act in 1998 and ATSIC was disbanded in 2005 due to allegations of mismanagement. Under the Howard government ‘practical reconciliation’ was emphasised with a particular focus on indigenous health, education, housing and employment. An increasing concern over rates of crime and abuse in indigenous communities led to the Northern Territory intervention policy. In 2008 under the newly elected Rudd Labor government a national apology to the children of the stolen generation took place. As a class investigate what ATSIC was. When did it start and what was its purpose? Then discuss: do you think that peak bodies are an appropriate way for governments to involve communities in decision making? Can you think of other communities in Australia who have a representative peak body? In small groups make a list of three advantages and three disadvantages of representative or peak bodies. What question does the student panel ask Mr Brough? What question would you ask Mr Brough? Working in small groups, research and then create a timeline poster that charts the history of Indigenous political representation in Australia from 1966 to 2007.